Yesterday, I was driving to a restaurant with Elaine, Jack and Pete. I've driven to the restaurant from our house many times before, but yesterday, we picked Jack up on the way. Out Jack's driveway, right on Blossom, left on Seasons, right on Salisbury, right on Main. Then, I realized that I hadn't planned my route and needed to regroup. I turned to Jack and asked, "Is this how you get there?" 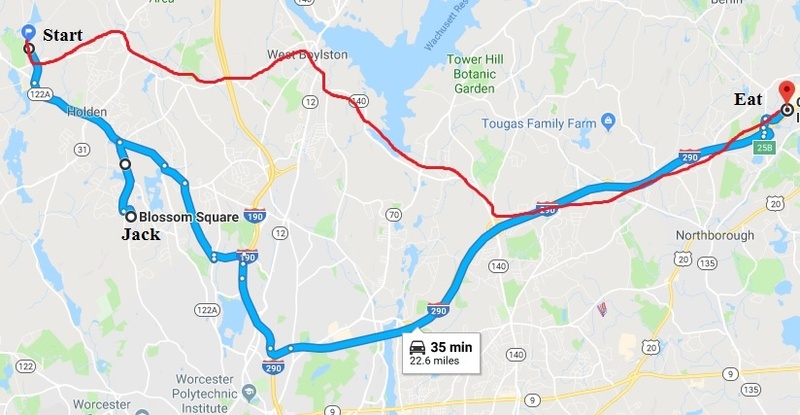 So, if we drove directly from the start, we'd follow the red route and eventually merge into the blue route and end up eating. However, we had to pick Jack up on the way, so we followed the blue route all the way. Notice that the entire blue route was longer than our normal route was, but that once we got to Jack's, the rest of the route was shorter. How often does that happen to your salespeople? How often do the get detoured or side-tracked when because they started at the wrong point? How do they start a cold call? How do they start an inbound lead? How do they start a bingo card lead? How do they start a website visitor chat? How do the start with an online referral? How do they start with an evangelistic introduction? How do they start with a repeat or renewal customer? How do they approach a decision-maker, influencer, white knight or chauffeur? How do they talk to the CFO, CEO, CTO, COO, board member or their admins? How do they start a first conversation? 2nd? 3rd? 12th? Who do they ask, "How do you get there from here?" How many opportunities do they lose because they don't ask or they ask the wrong person? If you want to ask a question via chat or talk to me, click the chat bubble at the bottom right of this page.